New York, March 14.--A fantastic "imperial secret" that had its inception on a New York farm and its conclusion in the court of the Romanoff's was told today after 20 years of silence by Edward Hatch, a New York merchant, former member of the firm of Lord & Taylor. The story began in 1903. The ill luck of the Romanoff dynasty restrained Mr. Hatch from revealing it for many years. Then it grew dim in memory, and retrospection made its details seem even more improbable. He continued to keep quiet until a few days ago when, he said, he talked with a woman who had been close to the former German court, and she told him an anecdote which corroborated his story. 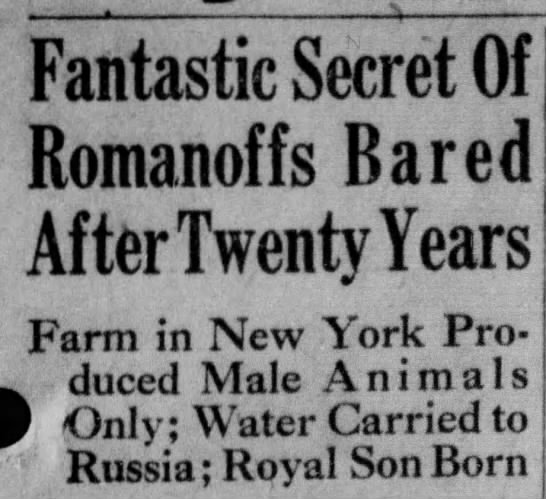 In 1903 a New York newspaper published an account of the lamentable state of affairs on the Hatch farm near Brewster, N.Y. Eighty-five per cent of all the animals born there were males, said the paper. Bulls that might have sold for thousands of dollars went to the butchers for what they could bring because the market was flooded. A flock of 30 ewes bore 26 males. All the chickens were roosters. Even the turkeys and carrier pigeons suffered from the hoodoo. 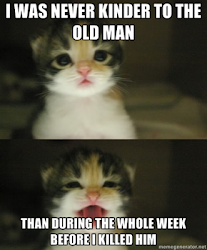 The house cat had seven kittens, and six were tom cats. A hired man and his wife on the farm had five sons. Even the corn would grow only on stubs, and scientists said it was male corn. Soon after this story was published, Mr. Hatch said today, a stranger questioned him about it at his story. He wanted an explanation. Mr. Hatch said he thought it might be the water, which analysis had shown contained much phosphorous and magnesium. The stranger then introduced himself as the Russian consul. He wanted a sample of the water. Mr. Hatch agreed. A few days later the stranger appeared at the farm with two uniformed attendants. With considerable ceremony they filled a keg with the water. The consul insisted on sealing the bung himself, with elaborate rites. Mr. Hatch asked for what purpose the water was wanted. The only answer he could get was "just an experiment." A year later cable dispatches reported that a male heir had been born to the imperial Russian throne. The preceding children of the czar had been daughters. Mr. Hatch called on the Russian consul. His questions were evaded, and when he became insistent the consul pointedly changed the subject. The merchant's father advised him to keep the episode to himself and he did so until he heard the recent anecdote, attributed to the German court doctor of that day, which seemed to corroborate the implications of his own experience. Considering what became of the royal family, that water was an even bigger hoodoo than anyone thought.